This book critically engages with several important events and statements found in Valmiki's epic poem, the Ramayana composed over 2500 years ago. Though certain methods were followed to preserve the Vedic texts, no serious methods were adopted to preserve the text of Ramayana. The poem spread to all parts of India and beyond through narrators of the epic who sometimes added their own explanatory verses to conform to local customs and traditions. In the second half of the 20th century, scholars at the Baroda Oriental Research Institute, after many years of labour and examination of over 2000 different manuscripts, compiled what is now accepted as the most reliable version of the poem. Based on this critical edition, a condensed English version by Dr Parameswaran was earlier published by the Manipal University Press. In the present book, Dr Parameswaran reviews the critical interpretations of scholars like Sheldon Pollock, R P Goldman and Wendy Doniger and has analytic responses to many unanswered questions. Dr M R Parameswaran has taught Mathematics as well as Sanskrit at the University of Manitoba in Winnipeg, Canada. His work "Studies in Srivaishnavism" has been well received by academic scholars and Srivaishnavas. This book deals with several important events and statements found in Valmiki's epic poem the Ramayana. The poem was composed over 2,500 years ago. Strict methods had been adopted to preserve Vedic texts, but no strict methods were adopted to preserve the text of the Ramayana. The poem spread to all parts of India and beyond, through narrators of the epic who sometimes added their own explanatory verses; the need felt to make some details conform to local customs also contributed some changes in the text. In the second half of the 20th century, scholars at the Baroda Oriental Research Institute after many years of labour and examination of over 2,000 different manuscripts compiled what is now accepted as the most reliable version of the poem. We denote it by the symbol CE. 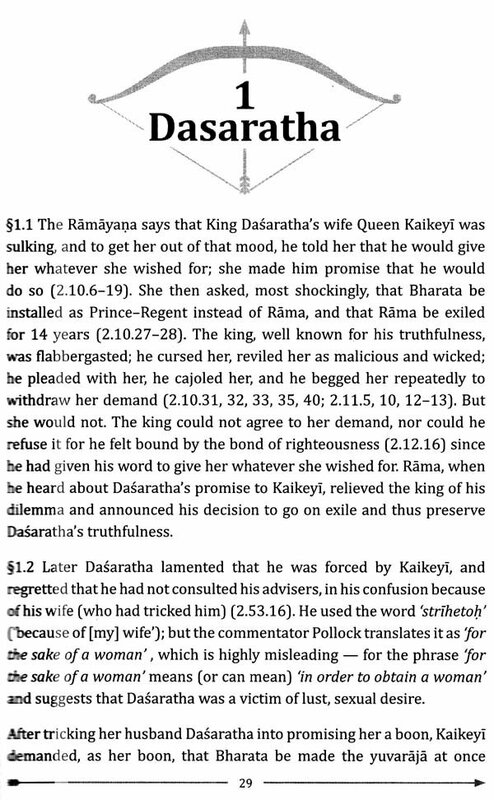 Good academic scholars use only the CE in their discussion of the Ramayana. But it must be noted that the CE consists of material that is common to the largest number of the over 2,000 manuscripts examined. It does not mean that everything in the CE is asserted to be a part of Valmiki's original composition; for the earliest existing Ramayana manuscripts were written several centuries — perhaps a thousand years or more — after Valmiki had composed his epic poem. By that time, many changes — alterations and additions — had crept into the manuscripts. For instance, the CE contains also, what is called the Uttara-Kanda (in symbols: U-K). 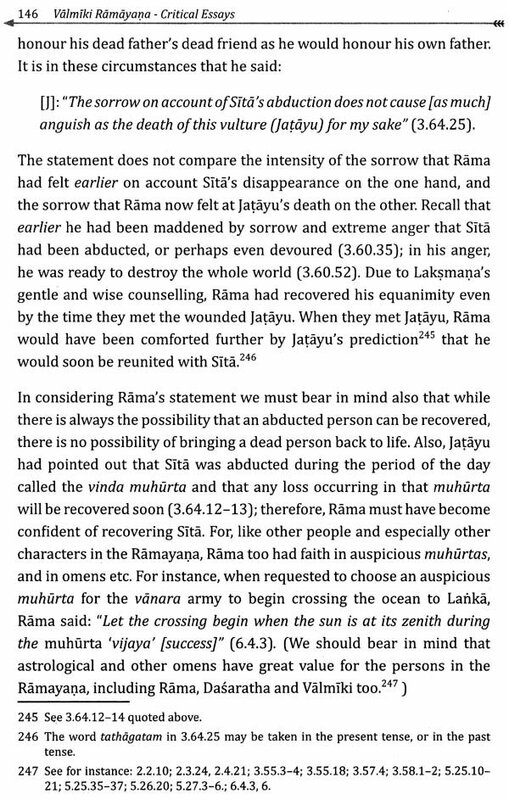 The present book shows what most scholars in fact recognize, that the U-K cannot really be a part of the epic as composed by Valmiki (see the Appendix at the end of the book). Indian scholars have not written much on the CE, but American authors have. 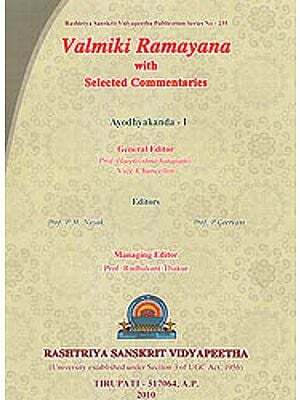 In the present book I give many references to (and some criticism of) in particular The Ramayana of Valmiki : An epic of ancient India (in symbols, RV), a multi-volume work with R P Goldman as General Editor, available in India and which gives a translation of the CE, as well as extensive notes and commentaries. In regard to the RV, I have discussed some issues with two of the translator-commentators: Sheldon Pollock and R P Goldman. Pollock did not want to engage in serious discussion of what he had written about 36-37 years earlier. Goldman on the other hand, discussed many of the issues; he also said that his views on many questions are not the same as he had held many years ago. Another American academic, Wendy Doniger, has written about Valmiki Ramayana as well as about Rama and Sita in several of her books. She repeatedly claims to be a Sanskritist; but this claim was debunked some years ago by Prof Witzel of Harvard University. Indeed, even a child who has had an elementary course in Sanskrit will be shocked to learn that Professor Doniger repeatedly translates the word "vaksasi" as "in the back". (The word means "in the chest.") Prof Doniger herself has said that the U-K is a later "accretion" to the Ramayana; yet, in her recent book The Hindus she repeats several paragraphs from the U-K in her discussion of the VR (the symbol VR stands for the Ramayana of Valmiki, the Sanskrit original; the symbol RV stands for the multi-volume work in English by Goldman et al and stands for the phrase: "The Valmiki Ramayana: An epic of India'). Her writings contain a large number of mistakes. She is distinguished for her lack of academic sense. Perhaps that is why she is called a "distinguished" professor. Some time ago, I raised some 40 questions about what she had said about the VR, but she declined to enter into a discussion on any of them. During the twenty-five or more centuries after Valmiki had composed the epic poem known as the Ramayana, its text got corrupted and several versions arose in various parts of India. These versions differ from one another, sometimes trivially and sometimes quite substantially. (In what follows, the term Valmiki refers to the text, and not to a person in the text itself, unless expressly stated otherwise.) The Oriental Research Institute in Baroda (Vadodara), India in the middle of the last century engaged a large number of scholars to examine more than 2,000 palm-leaf and other manuscripts that were available in India and Nepal. After several years of scrutiny, the scholars compiled what is called the 'Critical Edition' (abbr. 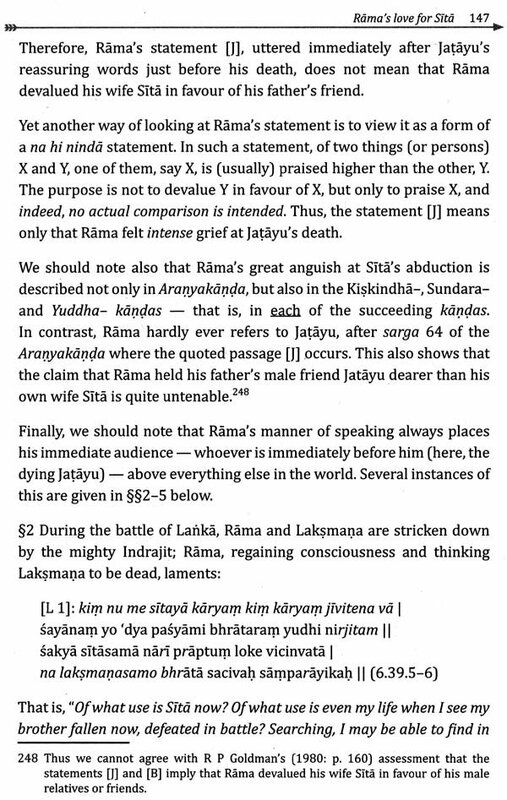 : CE) of Valmiki-ramayana (abbr. : VR). It is acknowledged to be the most reliable text of the epic. Most people even in India know the Ramayana — the story of Rama and Sita — only through versions of the Ramayana in the regional languages, or by listening to expositions of the recension of the epic that is popular in the region in which they live. None of the recensions correspond exactly to the CE. There are no translations of the CE in any Indian language. Nor were there any in English (or in any other language) till a group of scholars in America, under the leadership of Prof R P Goldman undertook the task of translating the CE into English. Six volumes have already been published (by the Princeton University Press), with translation, notes and comments. We shall denote this multi-volume work by the symbol RV. Each volume of RV contains a large number of comments by the editor of the volume. The volumes are readily available not only in America but also in India. As the only available English fool translation of the Ramayana, the RV is in danger of being considered and authoritative. My study therefore often refers to the RV. The translation in the RV makes good reading and is generally acceptable, although it is not free from errors (especially in volumes 2-4). However, the translator's attitude may influence the translation, which in turn might reinforce his/her attitude, and the average reader has access only to the translator's judgments on various issues. Also, the volumes are not totally consistent with one another. In each volume of the RV, the introductory chapters, which contain the comments of the translator and commentator of the particular volume, are much less acceptable than the translation as a whole (again, especially in volumes 2-4). 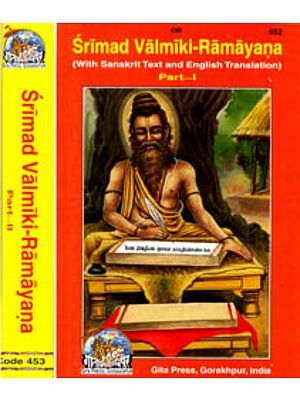 The introductory chapters in especially volumes 2-4 of the RV, from which the average reader will form his/her opinions, often give a slanted and highly distorted picture of the characters in the Ramayana, almost always tending to deny or diminish the nobility of the characters in the Valmiki-ramayana, whether it be Dasaratha, Kausalya, Sugriva, or even Rama himself. Several of commentator Pollock's comments especially in vol. 2 are quite unacceptable, as we shall see; and he hypothesizes also what a pre-Valmikian text of the Ramayana had said. His comments would hence in fact be irrelevant to the study of Valmiki-ramayana as given by the Critical Edition. 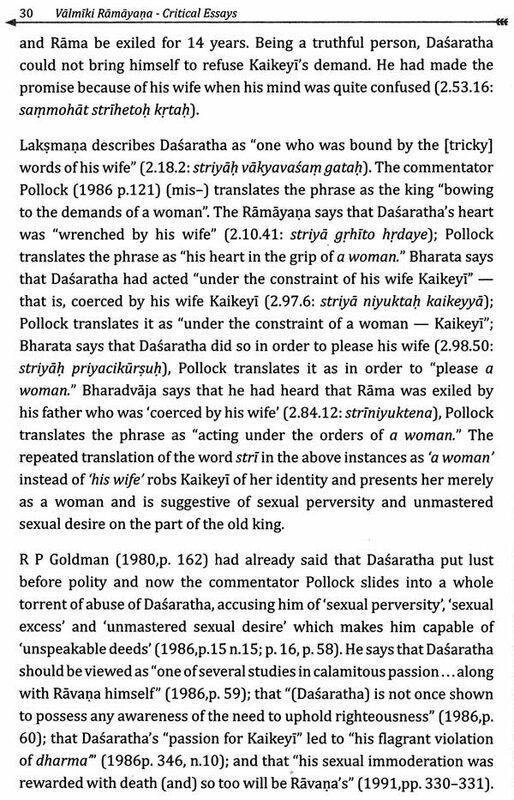 Besides, it should be noted that R P Goldman (2003, p. 22), the General Editor of the volumes and without doubt the best American scholar dealing with the Ramayana, says that there is no evidence of an earlier version of the Rama story ever having actually existed. Many comments of the commentators' in especially volumes 2-4 bring to one's mind a remark by R P Goldman who said, "characters like Rama or the Buddha . . . resonate faintly, if at all, with western scholars.' It should be noted that the famous poet and literary critic A K Ramanujan (1992) has said of the translation, introductions and footnotes of RV: "[They] inevitably contain twentieth-century attitudes zired and misprisions" (p.45). One should note Ramanujan's choice of the word 'misprisions'; it means mistakes and misunderstanding as well as scorn and contempt; and his words "twentieth-century attitudes" could be taken to mean "American/western/Judeo-Christian" attitudes. It is therefore unfortunate that many academics in India seem to have accepted whatever American academics have said. For instance, an academic at the Delhi University is reported to have said: "Every version the of the Ramayana is clear that . . . [Ravana] was a man learned and 3:tor refined . . ." also that "Rama even goes against dharma and shoots Vali in the back ..." That is all false; in particular, (i) Ravana cannot be called The 'refined, for he had abducted many women, and (ii) no version of the rich Ramayana says that Rama shot Vali in the back; only American academics ted like W Doniger (2009, pp.236, 237; again in 2014: p.523; p.528) and P lost Richman (2001, p.6) say so, as well as Indian academics like the Delhi the University professor who is reported to have echoed their statement. During the last three decades, several North American scholars have written on topics in the Valmiki-ramayana. Unfortunately, almost all the writings suffer from certain grave defects. The scholars have accepted it a without proper scrutiny what their academic colleagues have said, and have built their understanding of the Ramayana on such earlier statements of their colleagues.